because He said, ‘I am the Way.’"
Born in 1347, the 24th child of a wool dyer in northern Italy, Catherine was very sensitive to spiritual realities from childhood. From the age of six she could see guardian angels as clearly as the people they protected. Catherine became a Dominican tertiary when she was sixteen, and continued to have visions of Jesus, Mary, and the saints. She was one of the most brilliant theological minds of her day, although she had no formal education. At a very difficult time in the Church’s history, Catherine persuaded the Pope to go back to Rome from Avignon, in 1377, and when she died she was endeavoring to heal the Great Western Schism. 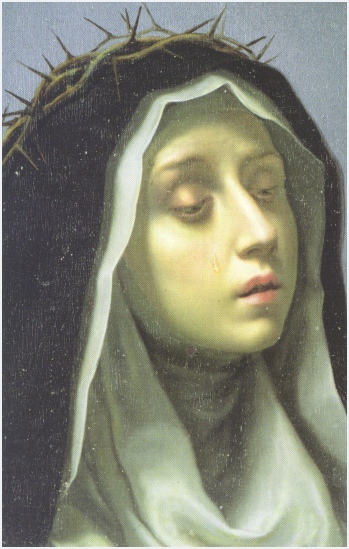 In 1375 she received the Stigmata, which was visible only after her death. Catherine’s spiritual director was Raymond of Capua. Her letters, and a treatise called “a dialogue” are considered among the most brilliant writings of the saints. Catherine died in 1380 when she was only 33, and her body was found incorrupt in 1430. Her tomb is under the altar in the Church of Santa Maria Sopra Minerva, in Rome. I know of no means of savoring the Truth and living with it, without self-knowledge. It is this knowledge which makes us really understand that we are nothing, that our being came from God when we were created in God’s image and likeness; and also that God created us a second time in giving us the life of grace through the blood of the only Son, blood which has shown us the truth of God the Father. We were the earth where the standard of the cross was planted. We were the vessel that received the blood of the Lamb as it streamed from the cross. Why did we become that earth? Because the earth would not hold the cross upright; it would have refused such a great injustice. The nails could not have held the Lord fixed and nailed had not his love for our salvation held him there. It was love on fire with the glory of his Father and with desire for our salvation which fixed him to the cross. So we are the earth which held the cross upright and the vessel which received the blood. We who can recognize this and live as the spouse of this Truth will find grace in his blood, and all the richness of the life of grace; our nakedness will be the nuptial garment; we will be invested with the fire of love, because the blood and fire mingle and penetrate one another; it is love which has united the blood with the divinity and poured it out. We must live in simplicity, with neither pretensions nor mannerisms nor servile fear. We must walk in the light of a living faith that shines in more than mere words—and always so, in adversity as well as in prosperity, in times of persecution as well as in times of consolation. Nothing will be able to change the strength or the radiance of our faith if Christ who is the Truth has given us knowledge of truth not just in desire but in living experience.